Until 2004, the Indian Air Force (IAF) had nothing comparative to the Indian Army’s Para Commandos or the Indian Navy’s MARCOS to meet its special force requirements. It was after the failed attempts of terrorists to storm two air bases in Kashmir in 2001 that a need for an elite commando force was felt to ward off any terror strike and guard the airbases across the country. The force would be imparted training in unarmed combat, commando tactics and cutting-edge technological skills. 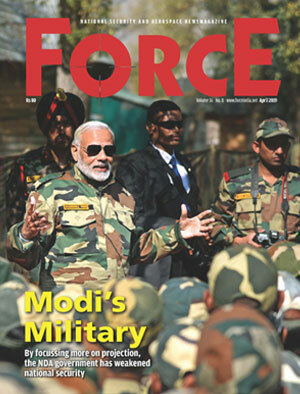 The good news came in September 2003, when the government sanctioned the proposed commando force with the strength of 1,080 personnel and the nomenclature ‘Garud’. The initial plan was to have 2,000 personnel with ‘Tiger Force’ as the nomenclature. However, this name was discarded and ‘Garud’ was used instead. The name ‘Garud’ is derived from ‘Garuda’, a humanoid bird in Hindu mythology said to be massive with a golden body of a strong man, red wings, white face, and a crown on his head. He is also considered ‘king of the birds’, the ‘enemy of all snakes’ and the ‘vehicle of Vishnu’. Garuds, unlike the special forces of the army and navy, are not volunteers but recruited directly through airmen selection centres via advertisements. Once a recruit completes his training, he is absorbed into the commando force and retains the stream throughout his career. This is to ensure the best men are always available to meet any challenge. The basic training of the youngest Special Forces of India, as Garuds are called, lasts for 72 weeks, the longest among all the Indian Special Forces. To qualify as a fully operational Garud, a recruit has to undergo a training of around three years comprising different phases. Initially, the recruits are trained at Garud Regimental Training Centre at Hindon, Uttar Pradesh. The Phase I of the training comprises the basic military training and lasts for 12 weeks. This is to convert recruits into partially trained soldiers. Subsequently, the candidates undergo basic Special Forces’ training and the advanced Special Forces training. The Special Operations’ training is imparted by an amalgam of Special Frontier Force, Army, National Security Guards (NSG), and the paramilitary forces. Thereafter, the qualified trainees are sent for basic airborne training to Parachute Training School (PTS) at Agra, where they train alongside the paratroopers of the Indian Army. In the remainder phases of the training, areas like jungle and snow survival, and others are concentrated on. Furthermore, the trainees also train at Indian Navy’s Diving School and the army’s Counter Insurgency and Jungle Warfare School. In the final stage, trainees, in order to gain operational experience, are attached to Special Forces Units of the Indian Army and take part in active operations. After induction, a Garud emerges as a soldier specialised in special reconnaissance, airborne operations, direct action, airfield seizure, air assault, counter terrorism, special operations, combat search and rescue, etcetera. “Garuds are the specialists,” says retired Air Vice Marshal Manmohan Bahadur. “They are trained with the best and have equipped themselves well,” he adds. The Garud Commando Force, which made its first public appearance during the Air Force Day celebrations in New Delhi on 8 October 2004, came face-to-face with their first-ever challenge reported in January 2016, when six heavily armed militants managed to sneak into the premises of the IAF base in Pathankot, a base of MiG-21 fighter planes and Mi-25 attack helicopters. The attack was second of its kind on an IAF facility in 14 years. Garud Commandos fought alongside the army and NSG and prevented the attackers from entering the area where the high-value assets were parked.